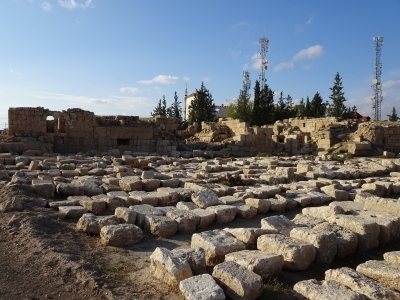 Al Qastal (Settlement) is part of the Tentative list of Jordan in order to qualify for inclusion in the World Heritage List. Now this site is currently hard to find. There are absolutely no street signs, Google Maps does not know it, my car GPS does not know it. I ended up driving slowly up and down the side road towards the airport, looking out for anything that looked ancient and archeological. Excuse my, have you seen the lost city of Al-Qastal ? It might have been lost again ! Luckily, there is a modern settlement with the same name, and somewhere in between the ruined modern houses are the ancient ruined houses ! As it turned out, the site is not really prepared for touristic visits. Like, totally not prepared. There are no signs, fences, pathes, visitor, keepers or anything. Some archeological clean-up has taken place, but that's it. You are completely on your own here - which is kind of cool, as you can unleash your inner explorer and see what interesting things turn up. So what's to see ? Quite a lot, actually. The site is bigger than most of the desert castle sites, comparable to Umm'er-Rasas (minus the mosaics - but who knows what lies still hidden ?). A lot of the buildings are still walkable, and it is nice to prowl around the half-ruined houses and speculate about their meaning. However, I could not detect any OUV-worthy aspect - all in all, it is just one more ruined settlement,and there are plenty in Jordan. - If coming from Amman, exit the freeway shortly before the airport (the same exit as for al-Mshatta). - Stay on the side road of the freeway, on the right side going away from Amman. Look to the right, away from the freeway. - If you pass a modern, black-and-white striped mosque near the road, the site is approx. 500m behind it. - You can see the site from the side road. I dont think you can spot it from the freeway. - There are two communication masts right beside the site - if you can spot them, go near. - Take one of the tiny roads towards the site. There is no parking lot or anything, but you can drive right up to the site.